When it comes to making product purchase decisions, customers are increasingly relying on each other for information and advice. That is not a new behavior, as people have always relied on the influence of friends. It’s just that social media technology has given it wings. Consumers are using Facebook to facilitate such activity, but that is only the tip of the iceberg. There are a number of other social shopping sites making their appearance on the social media landscape. Mobile commerce is becoming more of a force to be reckoned with, as well. The following is a list of five newer social shopping sites — this list follows “5 Social-Shopping Sites to Help Retailers, Consumers,” my article earlier this year] — all of which focus on consumers for product recommendations or information. Two are Facebook apps, one is a mobile app, and two are stand-alone websites. In some cases, merchants can play an active role by partnering with the sites so that their products can be included. In others, the onus is purely on the consumer to find and recommend products. 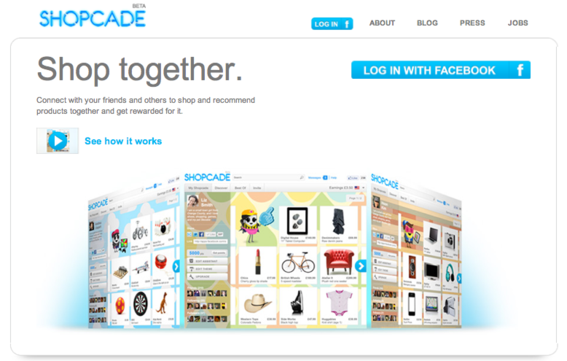 Shopcade is a personalized Facebook social shopping application. Shopcade is a personalized Facebook social shopping application to help consumers shop and recommend products and receive cash rewards based on purchase activity. Users can shop trending products recommended by their friends and become a “trendsetter” by recommending products of their own. Shopcade aggregates product data and shows what products are trending among friends, then provides suggestions for other relevant products they may be interested in, based on their Facebook “Likes.” Consumers can also create their own “Shopcades” – a dynamic list of their favorite products they want to share with friends via their social networks. There is benefit to merchants, as well. Currently, Shopcade offers over 40 million products from 20,000 brands. Interested merchants can apply to be added to the Shopcade database. 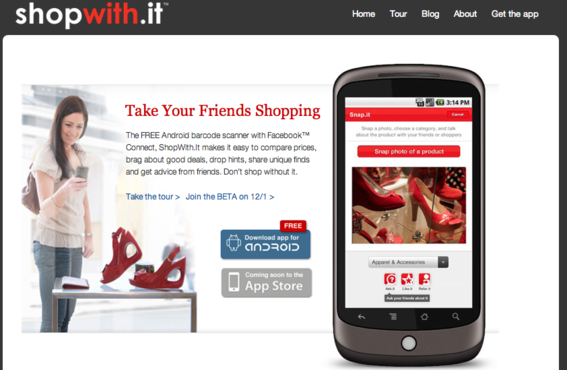 ShopWithIt is a mobile shopping application. Launched December 1, ShopWithIt is a mobile app that allows consumers to scan product barcodes or take photos, then share and discuss those products with friends and people who share similar interests. Users of the app can get instant feedback from friends, browse what products are trending within their networks, as well as share products they wish to recommend. When users scan the barcode of a product the app reveals information such as product descriptions, prices and availability. While it requires the user to be in a physical location, the app shows prices from both local and online retailers. 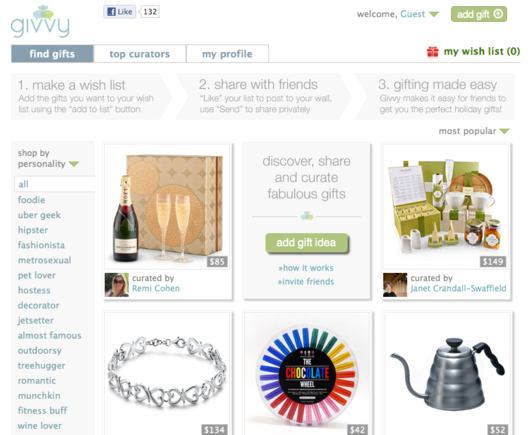 Givvy is a Facebook social shopping application focused on curation. Givvy is a Facebook social shopping application that lets users discover, share and curate gifts, then ranks them in order of popularity. The app emphasizing “curating” in that users themselves submit all gifts. The app has an “add gift” feature that enables users to submit gift ideas by copying and pasting the product URL from any merchant website. Users can follow the gift recommendations of their favorite curators or browse gifts based the personality type of the gift recipient. Users can also create gift lists to share with friends and family, and keep track of special occasions with a personalized social calendar. 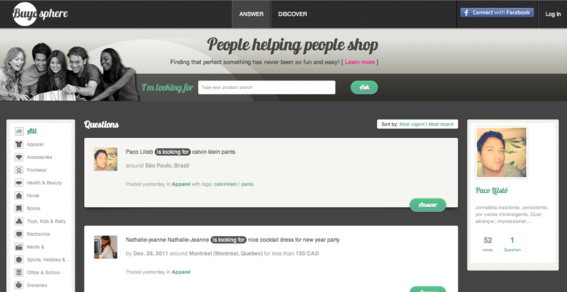 Buyosphere uses a question and answer format for shopping recommendations. Buyosphere uses a question and answer format to provide relevant shopping information to users. For example, if a user is looking for a particular product, he or she asks a question that the site then submits to the community for response. Users can upload a product photo, specify some details and list the price range they are willing to pay. To increase relevance of the response, the site only sends the question to people who have shown interest in a related shopping category . Buyosphere enables users to make a purchase directly from links supplied in answers or find out more information, if needed. Pikaba allows merchants to set up an account and list products. Pikaba works in a manner similar to Buyosphere in that users can post requests for products and services, then receive recommendations from their social network and review offers from Pikaba members. Ecommerce merchants can have their own products listed, as well, although fees are applied for the privilege. According to the site, Pikaba works like a “reverse auction” where sellers propose their goods and services and buyers select the best offer. Consumers request a product or service. The site then notifies merchants and other members of the user’s intention to make a purchase. Merchants can then bid on the shopper’s request if they so choose. Receive quotes and recommendations. 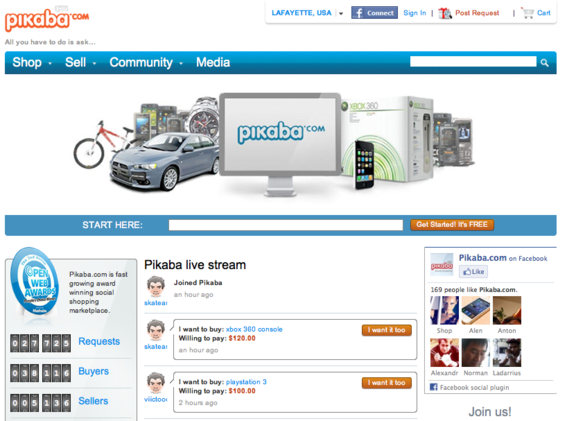 Pikaba users can provide advice or products and services. Sellers give the user their quote for the product. Close the sale. For the last step, users can select the quote they prefer, then contact a merchant to complete the transaction. At present, Pikaba only works with merchants who have a brick-and-mortar presence, but direct transactions are in the works, says the site. Merchants interested in participating in the site can create an account and list the products they have for sale. Again, there is a fee structure involved based on a tiered pricing model.